I have always been fascinated by cars. As soon as I found out there was such a thing as a mechanical engineering major, I was sold. I graduated with my BS Mech Eng spring of 2012 and an now working on my Masters degree at the University of Washington. 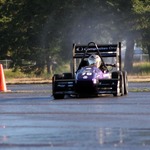 I have spent the last six years working with the UWashington Formula Motorsports team holding positions from tube grinding grunt to engine package designer, to technical director and TA. We're close to our goal! Here's a quick design teaser...Once you help us meet our goal we'll reveal the rest!